For something that provides very little practical use, there’s no denying our crowning glory says a lot about who we are and plays a big part in our level of self-esteem. Thanks to Posh’s pixie ’do, Gwen’s patent peroxide look and Britney’s constant image changes, we’ve got plenty of inspiration to dabble with experimental looks and the latest styles. But the damaging effects of excess styling and treatments such as hair extensions can put unnecessary strain on the hair and lead to a situation far worse than a case of Madonna-style regrowth. Extensions are made from either real hair or artificial hair which are woven into the hair and then glued or heat-sealed to stay in place. “Hair extensions are one of the worst possible things you can do to your hair,” said trichologist Leonora Doclis of the Belgravia Centre. They can actually lead to further hairloss or thinning by pulling on existing hair and lead to premature shedding and may even leave temporary, or in rare cases permanent bald patches. Weaving can also damage hair follicles causing breakage at the point of attachment. Since the technique can be damaging to existing hair strands, people need to think about the risks of the procedure. If you have very little hair, extensions may not be worth it because of the risk of increased hair loss. “Although the damage is usually minimal, sometimes it can be long term. There are also very few occasions in which hair extensions do not cause some sort of damage to your hair,” Leonora said. 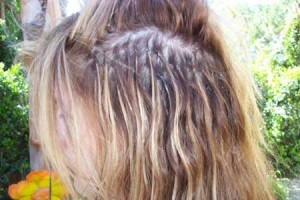 The damage caused by hair extensions will, in most cases, correct themselves. However Leonora has seen cases where the damage is so severe it resembles alopecia areata. In these cases there are treatments that can help speed up the regrowth process and may be more effective in the long-term to address concerns of thinning hair . Peaches Geldof bald patch – how healthy are hair extensions? Hair loss from weaves -can anything be done?